The National Judicial Council of Nigeria (NJC) has dismissed Justice Mohammed Yunusa and two other judges for judicial malpractices. It was learnt that the NJC met on Thursday and Friday to consider several allegations of judicial misconduct by Justice Mohammed Yunusa of the Federal High Court, Justice Olamide Falahanmi Oloyede of the Osun High Court, and an unnamed judge from Benue State. At the end of its deliberations, the NJC decided that the three judges deserved to be dismissed for acts of gross misconduct. An NJC source said that Justice Yunusa had the worst case, with numerous petitions accusing him of receiving kickbacks and bribes. He was also accused of writing and delivering two different judgments in one case. Our NJC source disclosed that one of the strongest cases against Justice Yunusa was his decision to grant an interlocutory injunction stopping the Economic and Financial Crimes Commission from investigating and arresting Senator Stella Oduah, a former Minister of Aviation, who is the target of an EFCC investigation. Ms. Oduah is accused of massive embezzlement of public funds and numerous acts of fraud in contracts. Justice Yunusa had been in the public eye after federal prosecutors commenced the prosecution of a well-known lawyer, Rickey Tarfa, as well as other persons accused of bribing judges. Justice Yunusa was named as the major recipient of bribes from Mr. Tarfa, whose trial is ongoing. The judge became notorious for granting injunctions aimed at stopping law enforcement agencies from carrying out their investigative duties, especially in cases related to corruption by major public figures. “We found out that Justice Mohammed Yunusa basically committed acts that amounted to subversion of the course of justice,” an NJC source said. 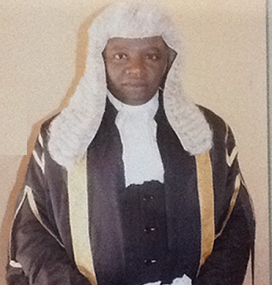 Justice Oloyede, a female judge in Osun State, was also sacked by the NJC. In 2015, Ms. Oloyede caused a scandal when, as a serving judge, she petitioned the Osun State House of Assembly urging them to impeach Governor Rauf Aregbesola whom she accused of corruption. NJC sources said the judges were dismissed after an exhaustive investigation determined that they were guilty of various acts of grave misconduct.